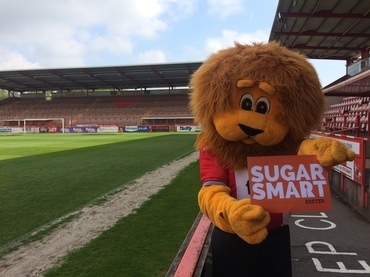 This newsletter provides an update on Sugar Smart Exeter, as well as Sugar Smart activity across the South West. For questions about the campaign, please email the team. We have made good progress, with Wonford Sports Centre being the first leisure centre to sign a pledge and conversations continuing with local hospitals. As ever, we will welcome and support any organisation looking to take Sugar Smart action. Visit the website or email us for more information. Recently, Sugar Smart Exeter has supported two fantastic events - the Children's Centre Playday in Belmont Park and the Pop Up Games in Priory Park, organised by Exeter City Community Trust. We are excited to be attending Powderham Food Festival in October, where we are holding a Sugar Smart session with a talk and family friendly activities. Hope to see some of you there! Are you passionate about creating a healthier food environment within Devon? We are looking to recruit Sugar Smart ambassadors to advocate for action within organisations. We want to make a real difference in Devon, but to do that we need enthusiastic volunteers! The more people talking about taking Sugar Smart action, the more this will become a reality for our food environment. Develop or improve skills in communication, health promotion and behaviour change. If you are interested in attending training, or hearing more about becoming an ambassador, email the team. Sugar Smart campaigns are launching all over the country thanks to the help of Sustain and Jamie Oliver's Food Foundation. The campaigns aim to raise awareness and encourage organisations and members of the public to take Sugar Smart action. The parents' jury gives a voice to parents on the food available and promoted to their families. To find out more and to apply click here. Men who consume a lot of added sugar had an increased risk of depression. Men with the highest intake had a 23% increased chance of suffering a common mental health disorder than those who consumed the lowest levels of sugar. High maternal sugar intake during pregnancy may increase the risk of allergy and allergic asthma in babies. This study found a link between increased intake of free sugars during pregnancy and dust mite, cat and grass allergies and asthma. Ban price promotions on sugary foods and drinks. Join us for Sugar Smart September! We're being Sugar Smart for the whole of September! Join us? Whether that be cutting out added sugar altogether, avoiding sugar on weekdays or just reducing the amount you eat generally. Last year we were surprised at how quickly our taste buds changed! The Food Smart app can help you watch out for hidden sugars. You may also find this article useful to help you watch out for hidden sugars, written by Sugar Smart supporter, Alex Powell. Why not make it a challenge within your workplace and sign a Sugar Smart pledge at the same time? Sugar Smart Exeter is a Food Exeter initiative, a Sustainable Food City supported by Sustain. We are looking for people to come with us to Powderham Food Festival, talking to people about the campaign and promoting Sugar Smart messages through family friendly activities. If you are interested, email the team.